Many of Colleyville’s more than 22,000 inhabitants improve their homes with swimming pools, hot tubs, and spas. 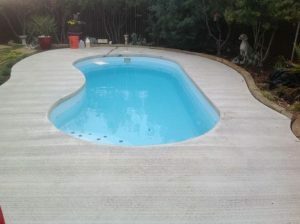 At Texas Fiberglass Pools Inc. we offer services that ensure these outdoor amenities stay safe, clean, and stylish. From Colleyville fiberglass pool repair, swimming pool resurfacing and pool maintenance, we keep Colleyville pools looking and operating like new. Pool Repair Colleyville provides satisfaction guaranteed services which are sure to get your family and friends back in your backyard! An upscale community located around 12 miles from the Dallas-Fort Worth International Airport, Colleyville offers its residents a quality lifestyle at home as well as easy access to Forth Worth’s many attractions. Though the suburb began as a small rural town, Colleyville has experienced substantial residential development over the past decade and has grown into a vibrant city. The pool contractors at Texas Fiberglass Pools Inc. are the region’s leading experts for fiberglass resurfacing for swimming pools as well as for hot tubs, fountains, and baptisteries. We offer a broad array of additional services in Colleyville too, including deck resurfacing, tile replacement, and coping renovations. Whether you’d like to add a feature like a waterfall or fountain to your pool or you need a timely repair for a crack or leak, our team is ready with the equipment, products, and services that it takes to get the job done. We’re pleased to offer homeowners in Colleyville customized solutions that can turn a backyard into a personal oasis. Every installation, repair, or maintenance project begins with a free written estimate, so you know upfront what to expect. Whatever your needs, we guarantee that you’ll be pleased with the results. Natural rock waterfalls are becoming more and more popular in backyard and commercial pool designs because they allow users to feel closer to nature, enjoy the view, and relax in the comforting and refreshing sounds provided by the waterfall. We take careful consideration into all our pool rock waterfall projects. We offer both natural rock and artificial rocks, to help create the ideal waterfall based on your budget. Almost anything is possible. Additionally, we examine the height, placement of rocks, and flow of water throughout the formation, to ensure that we achieve a natural look with an enjoyable sound as the water flows through your creation.